Have you ever waved to a bear and it waved back? 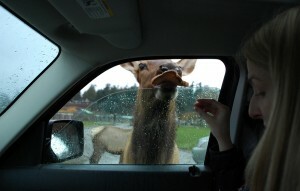 Have you ever let an elk eat out of your hand? This sounds like a dream world, but it’s very real. No, I’m not hallucinating. 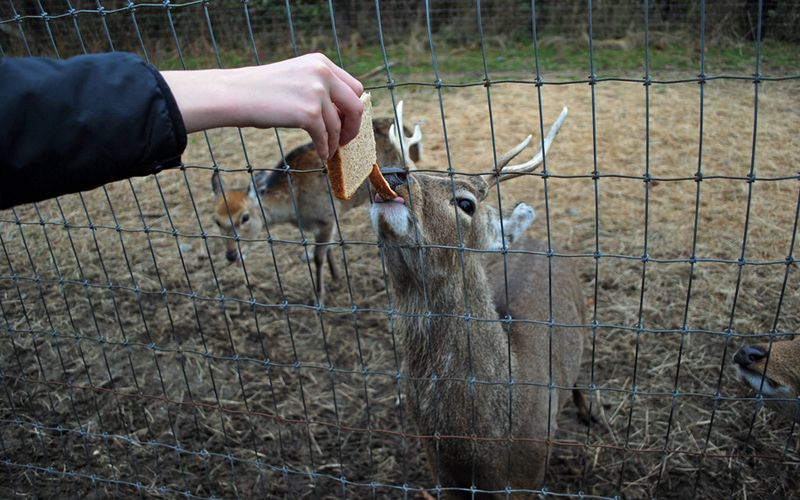 Olympic Game Farm in Sequim is where the magic happens. 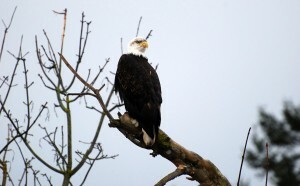 It’s a little out of the way on the Olympic Peninsula, but it’s totally worth a visit! First, I’ll give you some background. Olympic Game Farm (1423 Ward Road in Sequim) once worked with Walt Disney Studios. 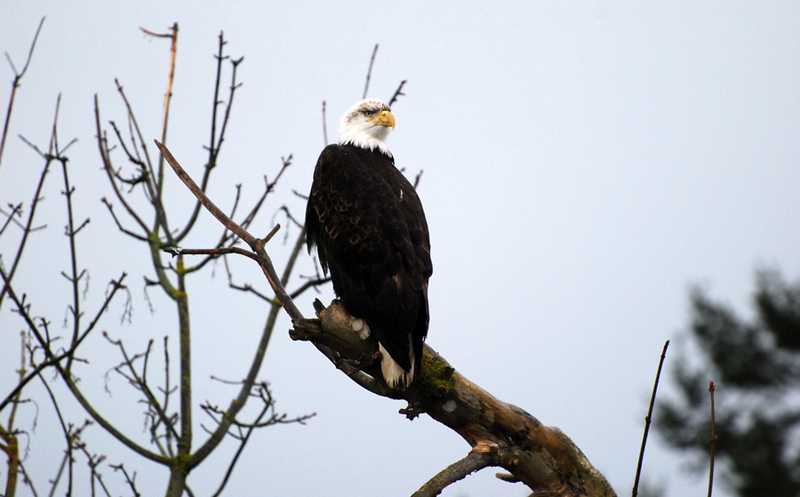 The animals that lived on the farm were featured in several movies and television shows, which were all filmed at Olympic Game Farm or on the Olympic Peninsula. In the late 1970s, Disney started to move away from nature films, so Olympic Game Farm opened to the public. Today, Olympic Game Farm is more popular than ever. 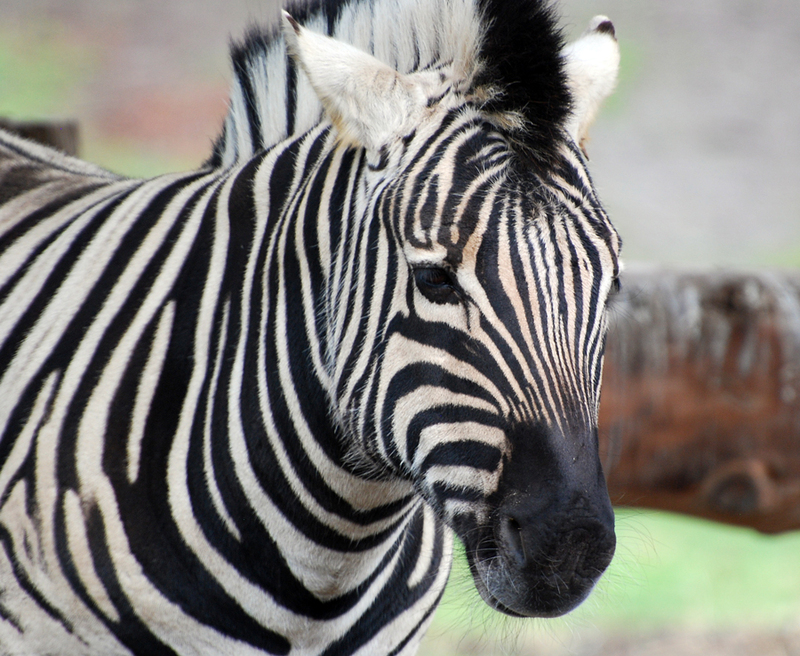 It’s home to incredible animals, including grizzly bears, zebras, tigers, wolves and bison. Do you want to know the coolest part? You can hand-feed most of the animals! NOTE: You’re only allowed to feed the animals 100% whole wheat bread. You can either buy bread at Olympic Game Farm or you can bring your own. The farm is strict about its bread policy (it’s actually a U.S.D.A. rule), so there’s no skirting around it (they’ll check your car to see what you have). These are some hungry critters, so we recommend taking two or three loaves per person (Tove and I had five each, but it was probably a little too much). You pull up in your vehicle, pay your admission (adults $12, seniors (55+) and kids (6-14) $11, children 5-and-under are free), and then continue through the farm on a driving tour. You’re only allowed to get out of your car at one point in the tour (right at the start where you can feed some deer), otherwise you stay in your vehicle the entire time. Don’t let that worry you, though. The animals will come right up to your car…and I mean they REALLY come to you. After driving past a few prairie dogs, you enter an area with llamas, yaks and zebras (keep your eyes peeled for bald eagles in the trees, too). This is where the feeding frenzy begins. The animals literally swarm your vehicle. Since you’re feeding the creatures out of your window (click here for video), Tove and I suggest pulling in your side view mirrors so they don’t get banged around too much. These animals are way too smart. They’ll run along side your vehicle, knowing you’ll eventually stop again, and some even sprint right in front of your car because they know it will make you stop. Sneaky little buggers. Once you get through the llamas and yaks, you wind into an area with the bears at Olympic Game Farm (don’t worry — the bears are in a fenced area, so they don’t come up to your car). These aren’t just your ordinary bears, either. If you wave to them, they might actually wave back. We drove through Olympic Game Farm in the winter, so the bears were a little sluggish, but Tove got a couple of the bears to wave at us (click here for video). The hint they’ll tell you at the beginning of the tour is to wave to the bears with bread in your hand. To get the bread, they’ll wave back. It’s pretty darn cool to 1) have a bear wave at you and 2) feed a frickin’ bear. 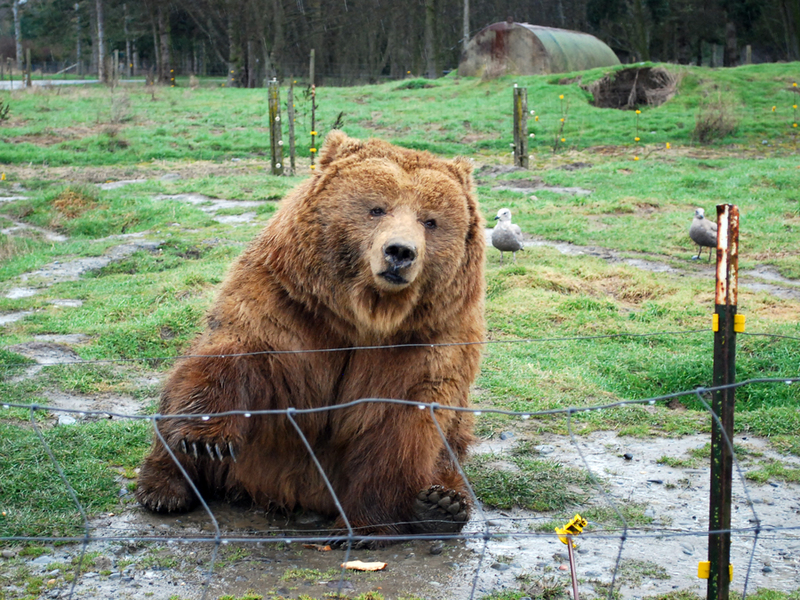 After you visit with the bears, you continue into the carnivore area of Olympic Game Farm. You can’t feed the animals in this section, you can only admire them. You’ll see a lion, tigers, wolves, bobcats, a lynx, cougars, and more. While you still have to stay in your car, you can get pretty close to these beautiful animals. NOTE: Before we visited Olympic Game Farm, we read negative comments about the conditions some of these animals live in. 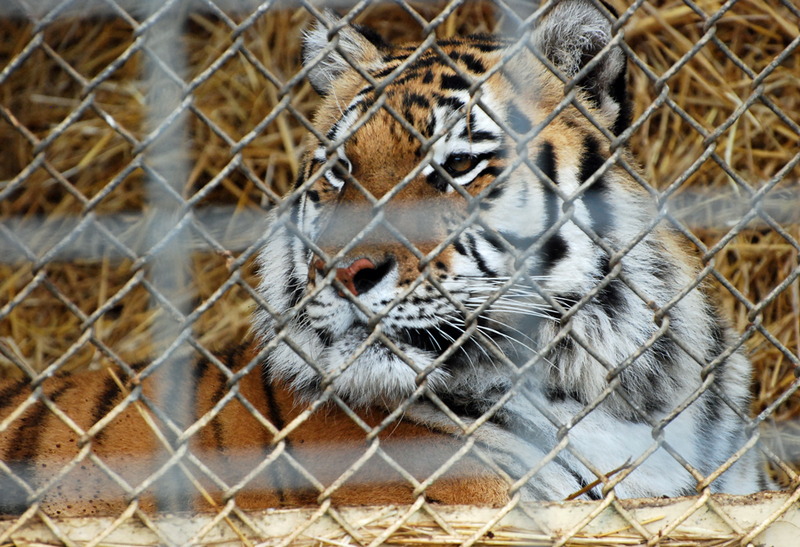 There’s no denying some of the cages are small for such large animals, but Olympic Game Farm offers a home to animals that might not have a home otherwise. 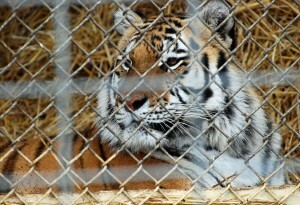 According to the Olympic Game Farm website, they welcome “in need” captive bred animals. I don’t know if it makes you feel better, but who knows where these animals would be otherwise? That’s me feeding a bison! From the carnivore section, you continue on to another open area with elk, European fallow deer, and bison. This is another spot where the animals come right up to your car. Since these are massive animals, Olympic Game Farm suggests that you don’t stop in this area (although you can still feed them as you slowly drive through if you want to). If you do stop, you run the risk of the animals damaging your car. With that said, there were certain parts where the animals were isolated, so we stopped to feed them. 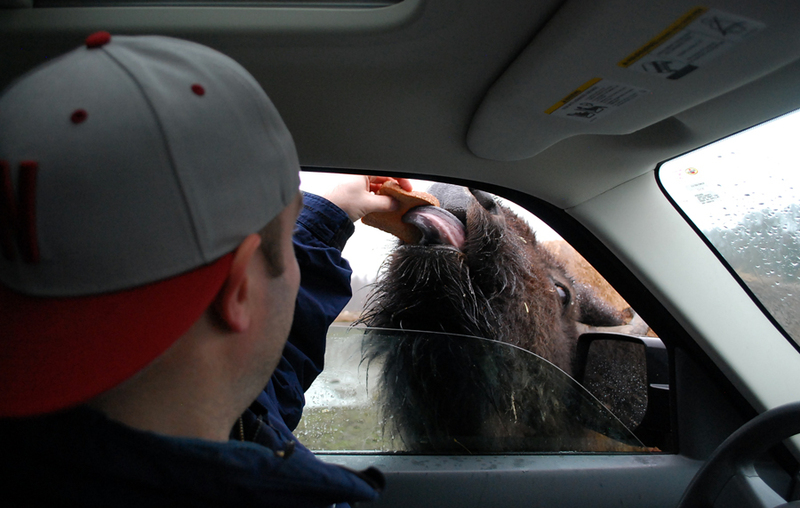 I thought the bison were the coolest animals to feed, because they have huge tongues that wrap around and take the bread right out of your hand. Tove and I enjoyed the Olympic Game Farm driving tour so much that we went through it twice. Once you pay for admission, it’s good all day, so you can go around as many times as you want to. A typical driving tour takes 45 minutes to an hour (so Tove and I were there a little more than two hours). During the summer, Olympic Game Farm also offers out-of-the-car mini tours, which includes a petting zoo, aquarium, a tour through an educational area, and a look inside a historic studio barn (from the Disney days). 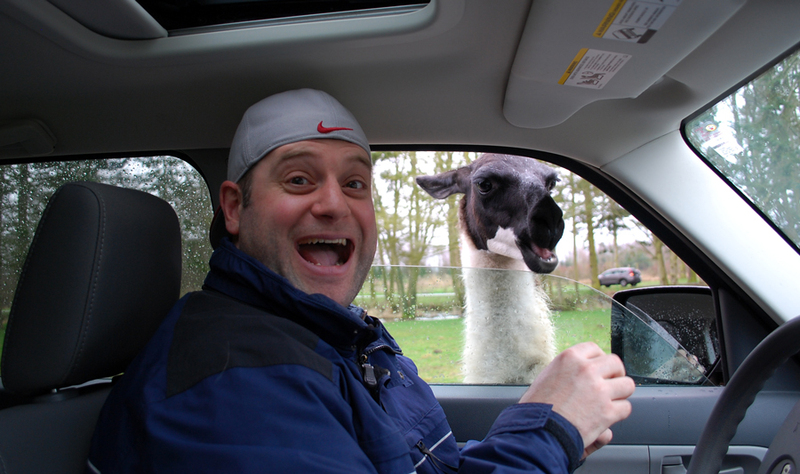 Taking a trip to Olympic Game Farm is truly a one-of-a-kind experience. I’ve seen a lot of these animals in the wild, but I never would have dreamed of feeding them. I’d tell you to stop by the Olympic Game Farm if you’re ever in the area, but I’d also tell you it’s worth a trek to Sequim (yes, a two-hour drive from Seattle) just to check the place out. 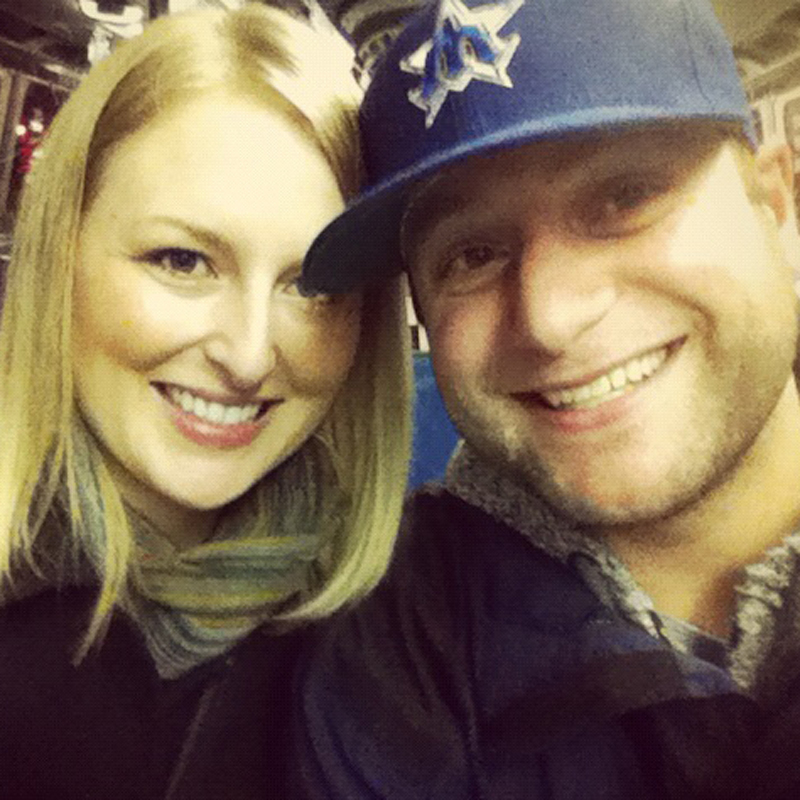 We’re two grown adults and we loved every second of our Olympic Game Farm adventure. We can only imagine how much fun this place would be for kids. 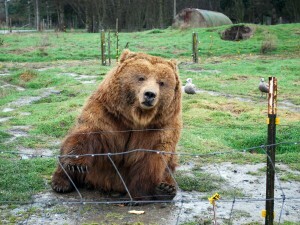 Have you ever visited Olympic Game Farm? How was your experience? We’d love to hear all about it. Please leave a comment below or connect with us on Twitter, Facebook, and Google+. Don’t forget to also check out Seattle Bloggers for more awesome adventures outside of the Emerald City!